Another year has ended and 2015 has started. Without further discussion, here's the 2015 installment of our Five Things to Watch in the coming year. Widespread concern over medical costs is driving health care away from volume-based reimbursement's familiar measurements and toward value-based health care. And just what does that mean? One major challenge radiology faces is that the epic buzzword that is value-based care tends to lack clear and simple metrics. Most in health care see medical value as some balance of outcomes, quality, and cost wrapped in a ribbon of patient satisfaction. Knowing that balance exists is far easier than defining it. "You can't just beat your breast and proclaim to the rest of the world that you provide high-quality imaging," David C. Levin, MD, said while presenting the Annual Oration in Diagnostic Radiology at RSNA 2014. "Everybody says that," the professor and chairman emeritus of the department of radiology at Philadelphia's Jefferson Medical College and Thomas Jefferson University added. "So those words don't mean a damn thing." • implementing consistent exam protocols. Almost all those components, at least in some form, have been part of quality radiology for years. Real-time decision support is the newest item on the list. Imaging organizations may reprioritize the importance of some of these items, but they're hardly new concepts to radiology. The ACR's Imaging 3.0 campaign is working to help its members operationalize the movement's key concepts of appropriateness, quality, safety, efficiency, and satisfaction. Perhaps the biggest change in many of these areas will prove to be quantification. As Levin noted in his RSNA address, saying you provide quality or value doesn't mean that much. Imaging organizations will be increasingly pressed to prove it. Business process improvement guru H. James Harrington once said, "Measurement is the first step that leads to control and eventually to improvement. If you can't measure something, you can't understand it. If you can't understand it, you can't control it. If you can't control it, you can't improve it." Radiology practices and hospitals alike are developing ways to measure and prove their value, which many expect to be a big part of success in the future health care economy. Increasing the overall interoperability of IT systems in imaging and the rest of health care is a significant piece of proving that value. Cloud-based vendor neutral archive architecture is a key component of sharing information from different systems. The information from those systems then needs to be integrated into the EHR system to put it where physicians can access and use it. What used to be separate PACS, RIS, and reporting systems are increasingly integrated with speech recognition, critical results management, report delivery, and outside imaging sharing. As one veteran PACS vendor put it, "Customers are now expecting IT to work together easily." Radiology groups and hospitals that deliver on the IT interoperability promise will take significant steps toward meeting the evolving criteria of value. That will help position them to be winners, or at least survivors, in the value-based health care economy. The transition process certainly won't be complete in 2015 because it touches many different areas of imaging. Breast density notification laws are now on the books in 21 states, according to the advocacy group Are You Dense?. Also, a breast density notification bill has been introduced to Congress. Following on the heels of that spread is the practical task of integrating notification and follow-up into the breast cancer screening and diagnosis workflow. State laws require notification and stipulate how a woman should be informed that she has dense breast tissue, but what happens next is still evolving. Advocacy groups are working to inform more women about what having dense breast tissue means and how they should approach their physician when they receive notification. On the provider side, women's imaging facilities are developing their individualized plans. Some try to have their screening mammograms read before the patient leaves from the visit, so if dense breast tissue is detected an ultrasound can be performed—or at least offered—immediately rather than require a second visit. But ultrasound is not the only option and perhaps not the best. Breast MRI and various gamma camera exams are possible exams depending on the circumstance. Those exams can shift the timing and workflow of follow-up on a dense breast finding. While 21 states have notification laws, most of them don't require insurance coverage of those follow-up exams. In addition to the changes in the screening and detection process, imaging centers must determine their role in educating women about breast density and building it into their workflow. A session at RSNA on the issue mentioned the need for education on this complex subject. "Density alone is not enough information to allow a woman to make a decision about what to do and how to go forward," Barbara Monsees, MD, said in the session. Monsees is a professor of women's health at Washington University in St. Louis. "If we're going to create a federal law, it should address research funding, and we should look at the entire package. The biggest risk factor is family history, and I can't tell you how many women don't know about that," she added. The ACR has expressed concern about a national law, including this from its statement on the issue: "While the ACR is not opposed to including parenchymal breast information in the lay summary, we urge strong consideration of the benefits, possible harms and unintended consequences of doing so." But with state laws on the books and strong patient advocacy efforts ongoing throughout the country, women's imagers will need to figure out how they'll handle the issue. The Affordable Care Act's (ACA) mandated coverage for certain smokers and former smokers at high risk for lung cancer started this month. The Centers for Medicare & Medicaid Services' (CMS) recent proposal to cover low-dose CT (LDCT) could result in lung cancer screening being covered by Medicare. Last fall's proposal could see a final rule published early this year. The ACA did not require Medicare to cover LDCT for American seniors. So the CMS proposal is significant in that it would extend coverage to patients between the ages of 55 and 74 with a 30-pack-year smoking history who currently smoke or have quit in the past 15 years. Under the CMS proposal, the first screening CT scan requires a "lung cancer screening counseling and shared decision-making visit" with a licensed health care provider. Presuming the final rule closely reflects the proposed rule, the ACA and the CMS decisions would create a strong foothold for lung cancer screening. The CMS proposal also requires participation in a data registry as an attempt to collect information to better refine future screening efforts. A survey conducted in 2014 and discussed in a session at RSNA 2014 found that 14 of 20 responding organizations screened five or fewer patients per week in their lung cancer screening programs. Those programs were typically not covered by insurance. "I think cost has been a very important barrier to this test," said Phillip Boiselle, MD, of Beth Israel Deaconess Medical Center in Boston. "If, as anticipated, this proposal is approved, it will remove the important barrier of cost for seniors who meet eligibility requirements for screening. When you couple that with forthcoming coverage from private insurers as mandated by the ACA, we anticipate seeing a much larger number of patients being screened, not only at these sites, but also at other sites across the country." Medicare and ACA coverage would certainly expand lung screening volume, but by how much and where remain unclear. Would screening become the territory of cancer centers and lung centers, or would it become routine in community hospitals and/or imaging centers? It will be interesting to see which facilities report growth in screening and queries from people covered by the ACA, as well as what happens in the Medicare population if that coverage kicks in at some point this year. But even if finalized, it might not begin until next year. Beginning in 2017, CMS will require physicians to use physician-developed appropriateness criteria when ordering imaging exams for Medicare patients. Clinical decision support (CDS) tools—specifically highly automated decision support available to physicians at the time an order is placed—are being developed and tested as a primary mechanism for efficiently meeting that requirement and putting useful information at clinicians' fingertips to help inform their diagnostic and treatment decisions. Some academic institutions have developed their own CDS tools and various vendors are working on integrating appropriateness criteria from the ACR and others into their radiology workflow and EHR products. Integrating CDS into referrer and radiologist workflow on the front end is the logical place to put these tools. Once it is widely in place in health care, decision support should provide transparent, data-driven information to guide decisions. Widespread use of CDS might also replace the third-party prior authorization companies that have been placed between physicians and patients to reduce unnecessary imaging and to curb costs. The utilization management organizations that grew up in the past decades were unpopular with physicians and patients, because they were an extra hoop to jump through before an examination. Prior authorization is also seen as operating without any transparency to physicians and patients. In addition to the front-end decision support, programs such as the PowerShare Innovation Program, which is working under contract with the ACR and Massachusetts General Hospital, want to develop decision support on the back end of the imaging workflow. Radiology reports would include evidence-based treatment options for various conditions reported from the exams. A referring physician receiving one of these radiology reports could expect to find guidance on possible treatment options that have been shown effective by quality research. That information provided by radiologists could bolster their consulting relationship with referrers. 5. Will ICD-10 Finally Be Implemented? While it wasn't a front-and-center topic at RSNA, 2015 is theoretically the year that ICD-10 will be implemented in health care. Of course that was supposed to happen last year until it was quietly delayed (again) by a provision in The Protecting Access to Medicare Act of 2014, which averted the 24% sustainable growth rate (SGR) cut to Medicare provider payments. A final rule set the date of implementation of the ICD-10 code set as October 1, 2015. With the Republican party taking control of the Senate, it wouldn't be surprising to see another provision popping up to delay the ICD-10 change as part of yet another stopgap funding measure and temporary SGR fix. Organizations have been preparing for ICD-10, but it will be interesting to see whether it actually comes to pass in 2015. It certainly bears watching, but to many people in health care, ICD-10 has a lot in common with the boy who cried wolf. But at the same time, it would be such a huge event that it can't be ignored. Health care is changing and radiology is adjusting, but RSNA seemed to house some sense of optimism that was absent in recent years. Imaging is not going away. It still offers an undeniably valuable service to referring physicians and patients. RSNA celebrated its 100th annual meeting in 2014. 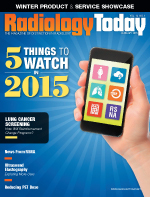 Neither it nor the specialty it serves are going away—and that seemed evident at RSNA 2014.